I love brownies. I love blondies. 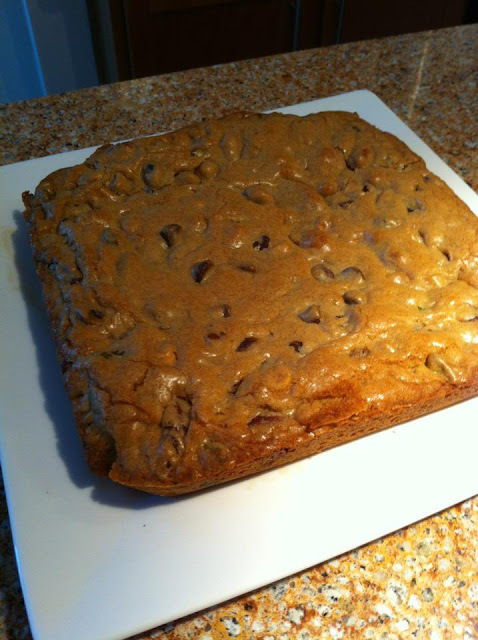 Today I surfed past a recipe for Ginger Walnut Chocolate Blondies from Joy The Baker. I didn't have candied ginger and I love multiple nut desserts (ask my family and friends). I also like the juxtaposition of sweet and salty, so I use salted roasted nuts. I revised JTB's recipe and made these. This should make 9 individual blondies. Place a rack in the center of the oven and preheat oven to 350 degrees F. Grease an 8-inch square baking sheet. Line with parchment paper, leaving two flaps hanging over the edges of the pan. Grease and flour the parchment paper. Set aside. In a medium bowl, whisk together melted butter and sugar. Whisk in egg and beat by hand until mixture is slightly pale, about 2 minutes. Whisk in vanilla extract. In a small bowl, whisk together flour, baking powder, baking soda, ginger, and salt. Add all at once to the butter, sugar and egg mixture. Stir until just incorporated. Mixture will be fairly thick. Fold in chocolate chips and nuts. Spread batter into prepared pan. Bake for 25 to 30 minutes, or until a toothpick inserted in the center comes out clean. They will be golden brown. Remove from oven and allow to cool completely before cutting. I like blondies COLD, as in refrigerated COLD. Try these and let me know how you like them!